Banks offer numerous “free” services like savings accounts and free checking. In fact, sometimes they pay you for leaving money in the bank, and you can even boost your earnings by using certificates of deposit (CD) and money market accounts. 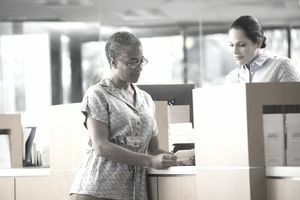 Unless you work with an online bank, most banks and credit unions also have physical locations with employees, and they run call centers with extended customer service hours. How do they pay for all of that? Banks earn revenue from investments (or borrowing and lending), account fees, and additional financial services. Whenever you give money to a financial institution, it’s essential to understand a firm’s business model and exactly how much you pay. But it’s not always clear how banks get paid. There are several ways for banks to earn revenue, including investing your money and charging fees to customers. The traditional way for banks to earn profits is by borrowing and lending. Banks take deposits from customers (essentially borrowing that money from account holders), and they lend it out to other customers. The mechanics are a bit more complicated, but that’s the general idea. Pay Less, Earn More: Banks pay interest at relatively low rates to depositors who keep money in savings accounts, CDs, and money market accounts. They usually pay nothing at all on balances in checking accounts. At the same time, the bank charges relatively high-interest rates to customers who borrow (using home loans, auto loans, student loans, business loans, and other types of loans). The difference between the low rate that banks payout and the high rate that they earn is known as the spread or the bank’s margin. For example, a bank pays 1 percent annual percentage rate (APY) on cash in savings accounts. Customers who get auto loans pay at least 4 percent (or more, depending on their credit scores and other characteristics of the loan). That means the bank earns at least 3% on those funds — possibly much more than that. Especially with credit cards, which might feature annual percentage rates (APR) around 20 percent. Investments: When banks lend your money to other customers, the bank essentially “invests” those funds. But banks don’t just invest by making loans to their customer base. Some banks invest extensively in different types of assets (some of those investments are simple and secure, but others are complicated and relatively risky). Regulations exist to limit how much banks can gamble with your money (especially if your account is FDIC insured). Still, banks are still able to boost income by taking more risk with your money, and those regulations tend to change over time. In addition to investing money, banks charge fees to customers. As a consumer, you’re probably familiar with fees that hit your checking, savings, and other accounts. Those charges are getting easier to dodge, but fees still make a significant contribution to bank earnings. In the past, free checking was easy to find, but now monthly account maintenance fees are the norm. The trick is to get those fees waived. In addition to earning revenue from borrowing and lending, banks offer optional services. You might not pay for any of these, but plenty of bank customers (individuals, businesses, and other organizations) do. Things are different at every bank, but some of the most common services are listed below. Credit Cards: You already know that banks charge interest on your loan balances, and banks typically charge annual fees to card users. They also earn interchange revenue or "swipe fees" every time you use your card to make a purchase (debit card transactions bring in much less revenue than credit cards). That's why merchants would prefer you pay with cash or a debit card, and some stores even pass those fees on to customers. Checks and Money Orders: Banks print cashier’s checks for significant transactions, and many also offer money orders for smaller items. Fees for those instruments are often around $5to $10. You can even re-order personal and business checks from your bank, but it’s usually less expensive to replenish online with a check printing company. Wealth Management: In addition to standard bank accounts, some institutions offer products and services through financial advisors. Commissions and fees (including assets under management fees) from those activities supplement bank profits. Payment Processing: Banks often handle payments for large and small businesses that want to accept credit cards and ACH payments from customers. Monthly and per-transaction fees are common. Positive Pay: If your business is concerned about thieves printing fake checks with your account information, you can have the bank monitor all outgoing payments before they’re authorized. But of course, there’s a fee for that. Loan Fees: Depending on your bank and the type of loan, you might pay an application fee, an origination fee of 1 percent or so, discount points, or other fees to get a mortgage. Those fees are in addition to interest you pay on your loan balance. Credit unions are customer-owned institutions that function more or less like banks. They offer similar products and services, they typically have the same types of fees, and they invest deposits similarly (by lending or investing in the financial markets). That said because they are owned by customers (or “members”) as opposed to profit-seeking investors, and because they are tax-exempt organizations, credit unions can sometimes pursue less profit. They might pay more interest, charge less on loans, and invest more conservatively. However, some credit unions pay interest and charge fees similar to what you’d find at a typical bank, so the different structure is just a technicality.